Lucasfilm has officially revealed a new theatrical poster for Star Wars: The Last Jedi ahead of the official trailer released yesterday. 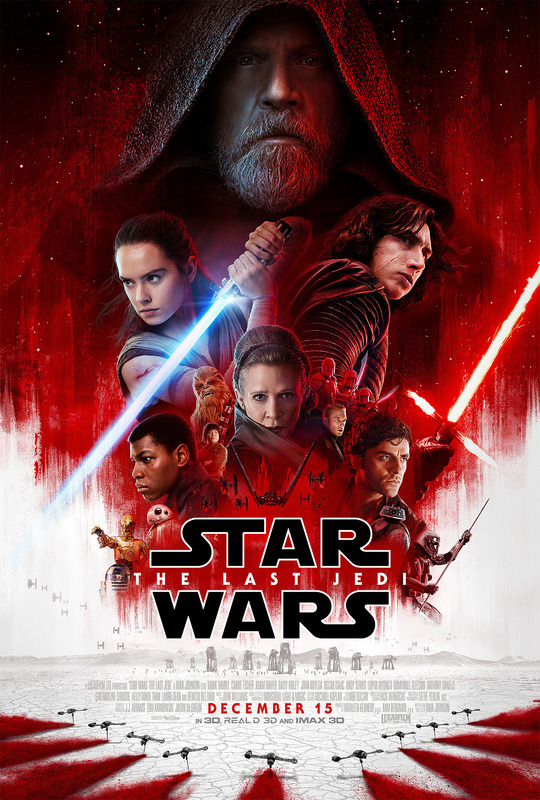 Though all of the principal cast is featured on the artwork (with Leia positioned front and center), the most prominent figures are Luke Skywalker, Rey, and Kylo Ren. This isn’t entirely surprising, considering that the latest trailer sets The Last Jedi up as this trio’s movie, with the war between the Resistance and the First Order relegated to the primary subplot. The old Jedi Master has the look of a weary, broken man, and from the preview we know he’s not too keen on training Rey. Luke’s facial expression is rather ominous, illustrating he’s far removed from being the good-natured hero who helped defeat the Empire. Rey and Kylo are positioned back-to-back, signaling their parallels – or perhaps partnership. It’s a nice touch to see the late great Carrie Fisher in the forefront as well. Though the film’s title is a direct reference to Luke and the arcs of Rey and Kylo are main focal points, Episode VIII is also going to serve as a tribute to the actress, who is as vital a part of Star Wars as anyone. Leia’s role remains largely a mystery for the time being, but it is said Fisher has more screen time when compared to The Force Awakens. As the Resistance looks to gain an upper hand against the First Order, she’ll be the one leading the charge. A special IMAX poster for Star Wars: The Last Jedi shows Luke Skywalker watching Rey train from a distance on the planet Ahch-To. The hype train for the latest chapter in the iconic saga is in full effect now, following the release of the latest theatrical trailer last night. Already, several fans have purchased their tickets for opening night, planning to see the film on the biggest of screens. It goes without saying that The Last Jedi is a movie that seems tailor-made for IMAX, fully immersing viewers in the galaxy far, far away. Lucasfilm will of course release the film in the premium format, where Rian Johnson’s visuals should be a wonder to behold. The scenes on Ahch-To look especially beautiful, and there should be a healthy amount of substance to complement the impressive style. Luke and Rey’s dynamic is said to be the beating heart of the picture, and judging from the trailer, Skywalker all but abandons the young scavenger when he becomes frightened by her power. Still, there will be sequences where the old Jedi shows Rey the ways of the Force, and one of them is depicted in a new poster for the film. 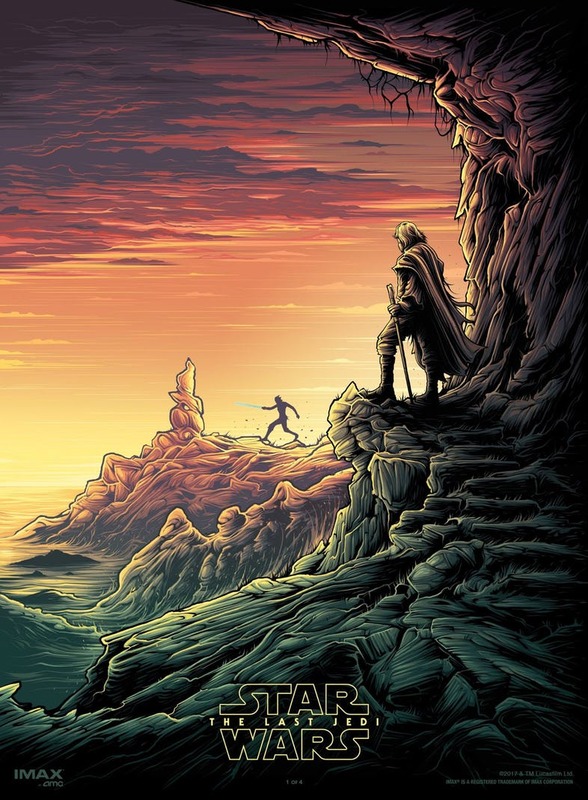 In the background, one can see the silhouette of Rey as she practices her lightsaber technique with Luke standing perched on the edge of a cliff as he looks out at his would-be apprentice. We already know that Skywalker is not going to be very welcoming towards Rey at the film’s outset, and while initially it was believed he’d warm up to her, the marketing is definitely implying Luke is an unwilling teacher. Seeing too much of Ben Solo in Rey, Luke seemingly cannot bring himself to complete Rey’s training out of fear he will repeat the same mistakes. How the relationship between Skywalker and Rey evolves is one of The Last Jedi‘s most intriguing elements, and it will be interesting to see where the two end up before Episode IX. There will likely be additional IMAX/AMC posters revealed in the near future, as ComingSoon notes that they will be handed out on December 17, December 24, December 31, and January 7. It stands reason to believe a different one will be featured at theaters each week, encouraging fans to come back for repeat viewings and complete a collection. If The Last Jedi is as good as the trailer is suggesting, moviegoers will have no qualms returning to the multiplex again and again. I’m still hoping that Kylo & Rey will be long lost twins Jaina and Jacen from the EU.